As I mentioned in an earlier post we are trying to make all the gifts for the boys this year. I'm really excited about giving this gift to Zane. I just know he's going to love this house and the peg people. I bought the house at Michael's. 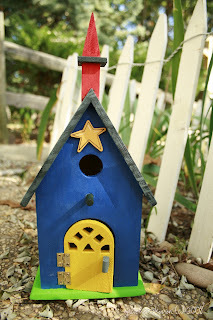 It's actually one of those paint it yourself bird houses. Since it had a door that works I knew it would be the perfect place for the peg people to live. And the added bonus is that the peg people can fit through the bird hole...what could be better than that! 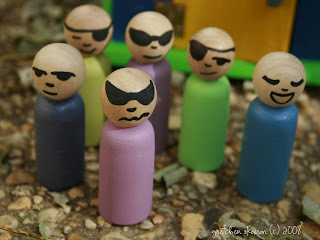 I bought the peg people also at Michael's they come in a pack of 2 and you paint them yourself. I still need to add a clear finish to the guys. I used the 40% off coupon that comes with our Sunday paper and you can also use competitor coupons at the same time, one for each store per person. Do you know what that means?? Cheap craft supplies!!! Really cute, Gretch! Nice job! This is GREAT. I know the boys are going to love this.